Nov 2017 Inverness , Nova Scotia. 4 hours of beachcombing on Inverness beach while on a day trip. I would have stayed all day if I could but the tide was coming in. I'm planning on going back in the spring and hoping to gather even more! Comments for Nov 2017 Inverness , Nova Scotia. I agree Gail. The sun helps a lot especially when looking for the Amber sea glass. 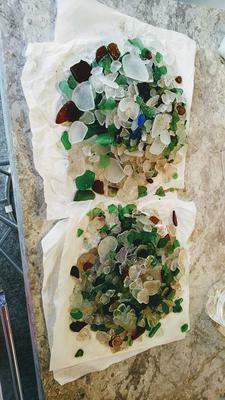 I hear that McNabs Island is a great place to find sea glass as well. I have to make a trip there sometime in the spring. I tried Blomidon beach as well but the tide was coming in quite quickly and I got there a little later than I should have. I wonder if there is any around Eastern Passage. Have you looked there? I must get up to Inverness some time. I hear it is always a good spot for glass. We have been spoiled with the gorgeous weather this fall in Nova Scotia. I was so excited ! Especially finding the cobalt blue. Next time I plan on staying the whole darn day ( if my back and legs will allow it haha ) I am hooked ! 4hrs collecting and this is your hoard! That must have been so much fun? And look - I can see some beautiful cobalt blue glass. That's always been my greatest wish, to find some that colour. That's awesome! Were you like a kid in a candy shop:) Have fun in the spring.